For over 3 decades C.S. Flournoy name has provided superior tree service for homes and businesses throughout Chesterfield and the surrounding Virginia area. Our entire team of contractors and arborists are fully licensed, insured, and highly trained in all areas of tree service. We work with insurance companies and can handle any damage claims. We also have ISA Certified Arborists on staff and all of our groundsmen and tree climbers are highly skilled. This allows us to help you with even the most difficult projects in a timely manner at a rate that is affordable to you. If you have a deteriorating tree on in your yard, then there's a chance that it come crashing down onto your car or home. Let C.S. Flournoy remove your dead trees before they collapse and cause severe damage or destruction to your property. We can clear areas when home addition or construction may take place and give you an open area. 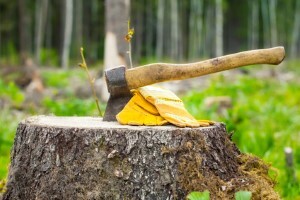 We remove all trees and debris and completely clean up your yard. When the job is done there will be no trace of the tree or the stump and your yard will have a smooth even finish. Over time your trees will experience overgrowth and begin to clutter up your yard. If you have two trees close together they will begin to grow into each other and ultimately stunt growth and cause other problems. We offer complete Chesterfield tree trimming service from top to bottom. We clear out the excess branches while grooming your tree making it an attractive feature in your yard. Trimmed trees stay clear of any power lines and offer a safer alternative to expanding growth. Routine trimming also gives your trees improved health and longer life. Contact us today and let us beautify your yard with newly trimmed trees. Nurturing your trees is more than just scattering a little fertilizer and watering the yard. It requires strategic planning and nutrients that is specific to both your trees and the geographic conditions in your landscape. This should only be done by experienced professionals who truly understand the needs of every species of tree on your property and how to properly care for it throughout the year. We visit your home, inspect each tree and take soil samples. We then make recommendations on how best to feed your trees in order to insure a healthy growth throughout your entire yard. If you are looking for Tree Fertilizer in Chesterfield, then please call 804-264-1000 or complete our online request form. I am writing to Thank you and the two employees who did an excellent job of cutting limbs from hanging over my roof. My tree really looks good and they cleared away all the cut off branches, overall I give them an A+ rating like your company has in your telephone book ad. I am very well pleased with your tree service company and will call you again whenever I may need tree service in the future. Thank you all so much for a great job! From Lisa in the office to Mr. Coffey doing our estimate, to the team who preformed the tree work-everyone was a pleasure to work with. I would not hesitate to recommend your company to anyone I know. You've always given me the highest quality of service and have kindly scheduled me as soon as possible, even earlier than expected this time. I wouldn't even consider calling anyone else. Thank You! We have had exceptional service from start to finish! The crew themselves are extremely kind and courteous. They are also very conscious of cleaning up after completing the job. We have personally used other tree removal companies in the Richmond area ... and will never call anyone other than C.S. Flournoy in the future.